As the 20th century began, the Arts and Crafts Movement, which emerged in the 1890's, flourished. Craftsmanship and eclectic styles were characteristics of this movement, visible in its framework and artwork. 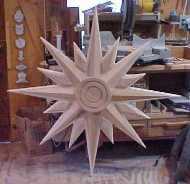 Handcarved designs were prevalent. 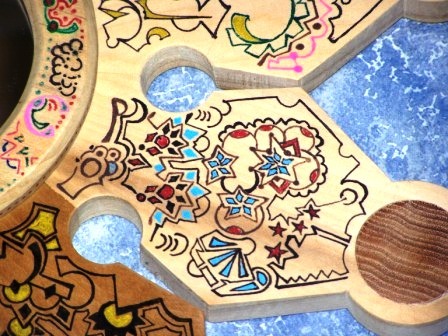 Arts and Crafts framemakers crafted the frame as a work of art and saw the framemaker as an artist in their own right. As the century came to a close, modernism would lead frame designs down yet another path, part of which took a turn towards minimalism. This minimalism has developed the frame into a dime store product that is all but invisible to the artwork. 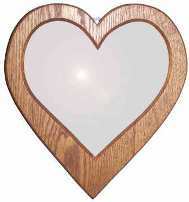 I personally believe a return to the Arts and Crafts philosophy to framecraft is in order. Frames can be designed and built to fit an area and to blend the significance of the art within the environment. 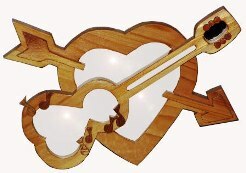 I've created a CraftGallery of my hand made wood craft items to sell. 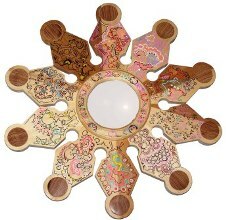 Making mirrors has always been an interest of mine, perhaps because they add function to the design of a frame. A detail of one of the points. 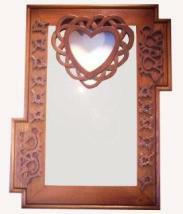 A mahogany frame with hand carved appliques.Dark finish. 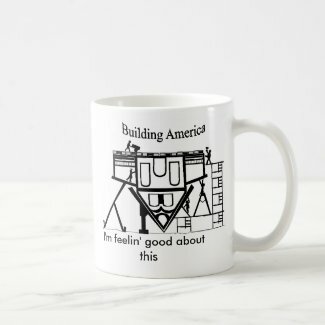 Remincent of an 1800's design. 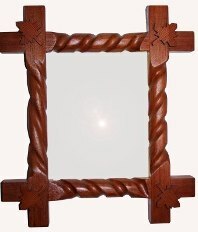 A corner shot of the previous frame in mahogany. 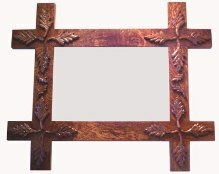 A mahogany frame with hand carved appliques.Dark finish. 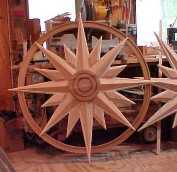 The following 16 point stars are Clear Cedar pieces that where used for a sign and then used in a victorian gable end decoration. 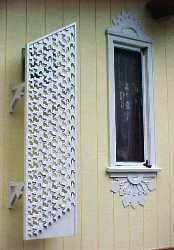 A trellis designed to hide a direct vent. I called it the 'Esher" trellis. Also the window to the right has interesting panels on the top and bottom. 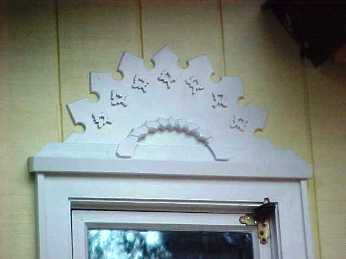 The bottom panel , which I called lace, became a theme in the trim pattern. 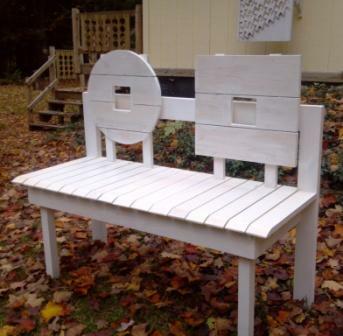 A Garden or Flower bench. 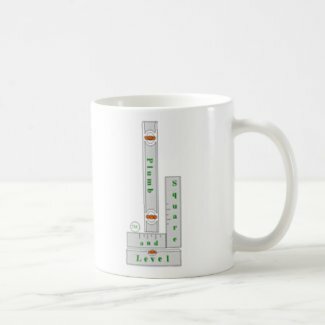 or just put it somewhere and sit.